Ronaldo continued his award winning week with a bizarre goal to help Real Madrid win 2-0 against Osasuna and march into the quarter finals of the Copa Del Rey. Madrid were already two up from the first leg so it was a damage limitation exercise for the home side in Pamplona. They created some chances but never looked like scoring against much classier opposition. The breakthrough cam on 22 minutes and who scored – of course it was the new world footballer of the year Cristiano Ronaldo. Ronaldo is famed for his wonderful free kicks, but this wasn’t one of them. The ball was heading straight to Andres Fernandez in the Osasuna goal when the keeper inexplicably let it squirm through his hand. 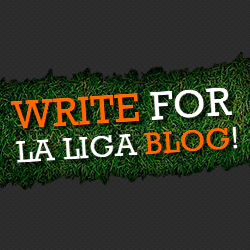 The ball bounced up, hit the keeper’s derriere and crossed the line to give Los Blancos the lead. The second goal came after 56 minutes, Jese sprinted down the wing and played a perfect cross that was gratefully accepted by Angel di Maria – no need for him to gesture at the Madrid fans on this occasion. It was a good win for Madrid that seals a tie against Espanyol but it was bad news for two Premier League targets. 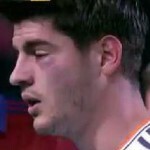 Young striker Alvara Morata, a transfer window target for Arsenal, received an elbow in the eye but as Madrid were already down to ten men he was made to play on despite a rapid swelling. 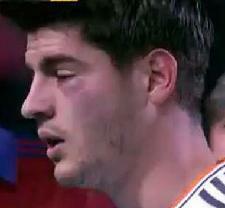 Eventually Morata could take the pain no longer and he walked off the pitch in tears. Why were Real Madrid down to ten men? Fabio Coentrao had been sent for the pitch after a wild challenge that earned him a second yellow card. Carlo Ancelotti defended his player, but in reality it could have been a straight red for the left back making his first start in two months. It could be his last moment in the all white shirt as his switch to Manchester United moves ever closer.